Illustration of the singlet fission process used to boost the number of excitons in an OLED and break the 100 percent limit for exciton production efficiency. The emitting layer consists of a mixture of rubrene molecules, which are responsible for singlet fission, and ErQ3 molecules, which produce the emission. 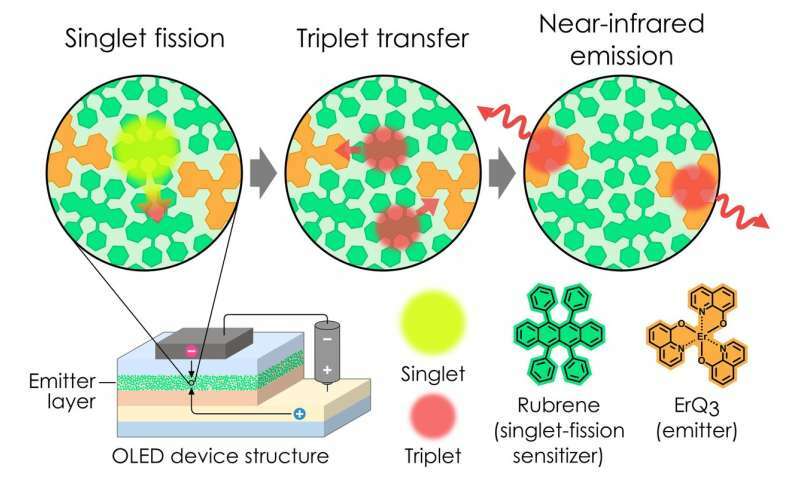 A singlet exciton, which is created when a positive charge and a negative charge combine on a rubrene molecule, can transfer half of its energy to a second rubrene molecule through the process of singlet fission, resulting in two triplet excitons. The triplet excitons then transfer to ErQ3 molecules, and the exciton energy is released as near-infrared emission by ErQ3. Credit: William J. Potscavage Jr. Researchers at Kyushu University's Center for Organic Photonics and Electronics Research (OPERA) in Japan have demonstrated a way to split energy in organic light-emitting diodes (OLEDs) and surpass the 100 percent limit for exciton production, opening a promising new route for creating low-cost and high-intensity near-infrared light sources for sensing and communications applications. OLEDs use layers of carbon-containing organic molecules to convert electrical charges into light. In normal OLEDs, one positive charge and one negative charge come together on a molecule to form a packet of energy called an exciton. One exciton can release its energy to create at most one photon. The triplet excitons are then transferred to a second type of molecule that uses the energy to emit near-infrared light. In the present work, the researchers were able to convert the charge pairs into 100.8 percent triplets, indicating that 100 percent is no longer the limit. This is the first report of an OLED using singlet fission, though it has previously been observed in organic solar cells. Overall efficiency is still relatively low in this early work because near-infrared emission from organic emitters is traditionally inefficient, and energy efficiency will, of course, always be limited to a maximum 100 percent. Nonetheless, this new method offers a way to increase efficiency and intensity without changing the emitter molecule, and the researchers are also looking into improving the emitter molecules themselves. With further improvements, the researchers hope to get the exciton production efficiency up to 125 percent, which would be the next limit since electrical operation naturally leads to 25 percent singlets and 75 percent triplets. After that, they are considering ideas to convert triplets into singlets and possibly reach a quantum efficiency of 200 percent.